The Hermitage is a cabin built onto the precipice of the 100-foot deep Rocky Fork Gorge in a deeply wooded setting. Hermitage offers two private suites for nature retreats of one or two people each – the Zen and the Eyrie – each suite with its own private deck and entrance. Hermitage sits well off the road and is isolated from the views of any other nearby residences. The interior of both suites is highly aesthetic and artistic in design, while view outside the bedroom windows of both suites is truly spectacular. The Zen River Room is the larger of the two suites at the Hermitage. 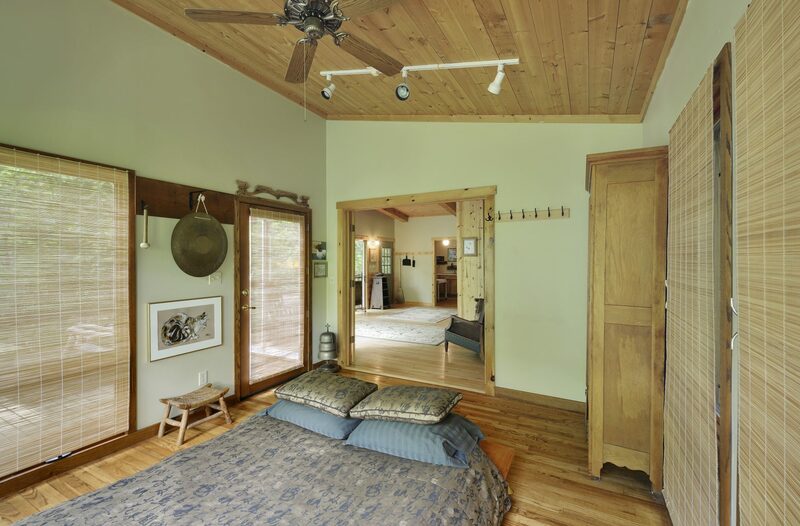 The Zen River’s bed is close to the floor and surrounded by floor to ceiling windows looking out into the gorge. The decor espouses elegant Zen-inspired simplicity. 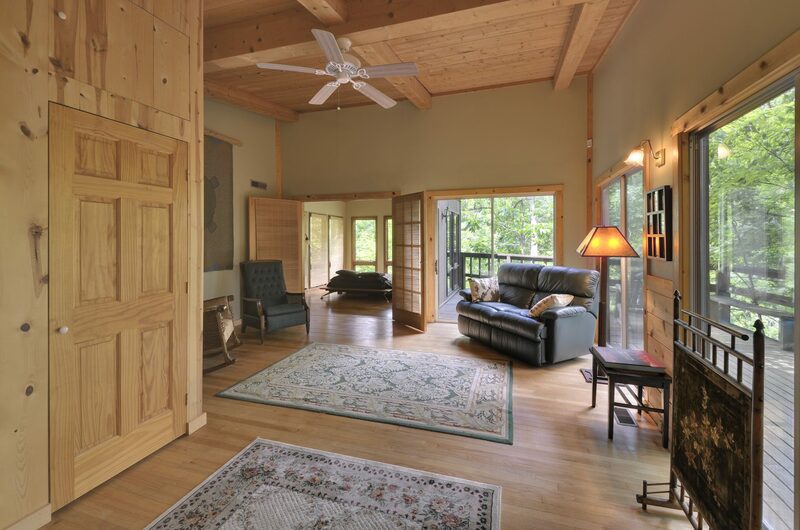 Hermitage is our most remote suites, yet they are located in the heart of the Highlands Nature Sanctuary, close to most of the trailheads and within walking distance of the Appalachian Forest Museum. Full-sized kitchen – Stove/oven, coffee maker, full refrigerator, kitchenware. 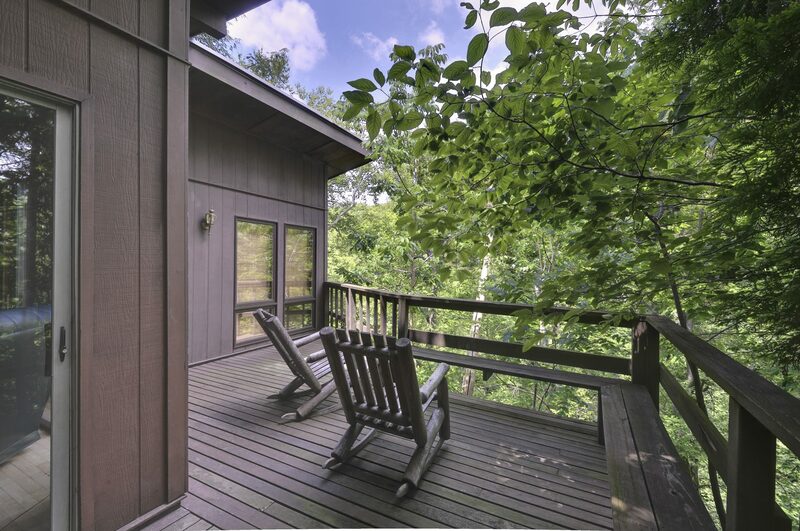 Large private deck with Adirondack rocking chairs overlooking the Rocky Fork Creek. Luxury bedroom with stunning view. $130/night – 2 night minimum stay. 25% discount on stay of 7 nights or more. 7.25% state sales and 3% county lodging tax.